“Example Lessons” have Orange Borders. Activities start with Making Bead Patterns. 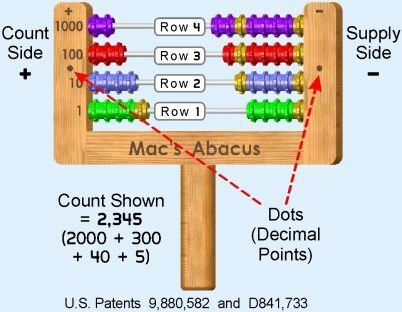 A set of 16 Bead Patterns builds familiarity with Mac's Abacus, while subtly introducing sets. Counting begins new pic above with simply matching loose Beads to same-color Beads of the Abacus Rows. 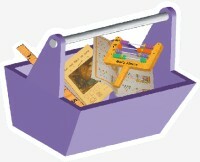 First 14 Lessons are full size (1/page) so your child can place the Abacus over the picture. Lessons 15 to 300 are presented 3 to a page (but shown 6 per page in the Teaching Guide). 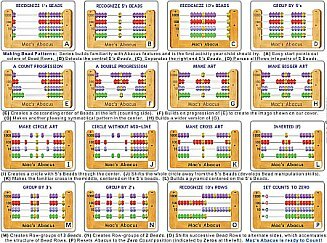 Counts range from 1 to 5 in the first 21 Lessons, gradually increasing thereafter. Objects are often clustered (pic above) to build the skill of Thinking in Groups (i.e. “3 at-a time”). Numerical Digits are first presented in Lesson 33 (pic above) by using Playing Cards. Finger Counts (pic above) follow. Concept of Zero is presented 3 ways: Subtraction Poster, Missing Parts (pic above) and using Special Dice. Other concepts presented: Length (pic above) and Time. Subtraction is introduced by blocking out objects. The second half of the workbook develops the Decimal System (place value) and uses this to teach counting Money (coins then bills). Pictures or real coins and bills are used.